This should totally be made mandatory. 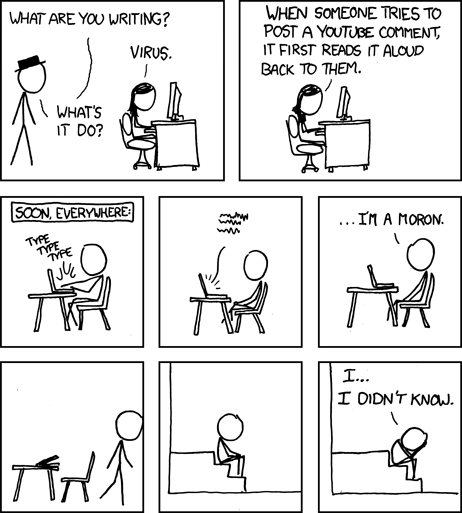 Not too long ago the wonderfully geeky and hilarious webcomic xkcd had a character writing a virus that would force YouTube commenters to listen to their own comments read back to them. One hopes that this might cut down on the general state of the comment sections over there. I sent a copy of the comic to a co-worker and added that I wish I had something similar to install around the office for people’s e-mail. Like most of Randall’s comics, it was dead on and hilarious. The placement of the button is interesting. It’s exactly where the post message button used to be, meaning quick commenters will discover it only when they accidentally click the new button. Hopefully they’ll do this with their speakers up at work. I can’t recall the last time I posted a comment on YouTube, I think it was to compliment some dude on his opera singing. Generally I don’t read comments at all on any site except personal blogs. I was briefly a fan of the Firefox extension YouTube Comment Snob, but in the long run it’s much kinder to my sanity to avoid the comments altogether. Previous story video: cross-dressing… for SCIENCE!! Spirit Airlines? Meet the internet. Internet? Spirit Airlines. I’ve never really understood the point of YouTube comments. When I do comment, I have an awful tendency to simply omit words. Don’t know why. Maybe having them read back to me would be a good thing. Also, why would anybody be on YouTube without their speaker on? @Gilahi: That’s the brilliance of it, in my opinion. Had this been around April 1, I would have dismissed it as a prank. But it makes me smile to think of a text-to-speech program trying to make sense of internet abbreviations, acronyms, poorly spelled words and the like. It makes me wish that the Pluperfect Virus, envisioned by a Washington Post style writer, were a real and true thing… maybe.